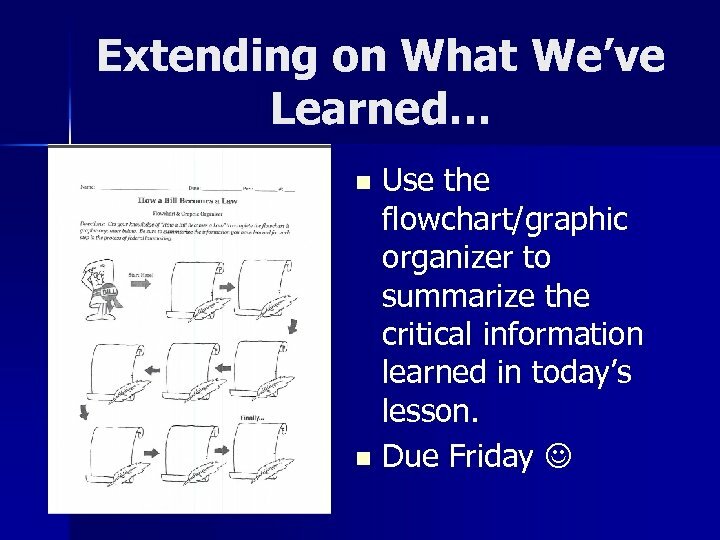 Let’s Review! 1. 2. 3. 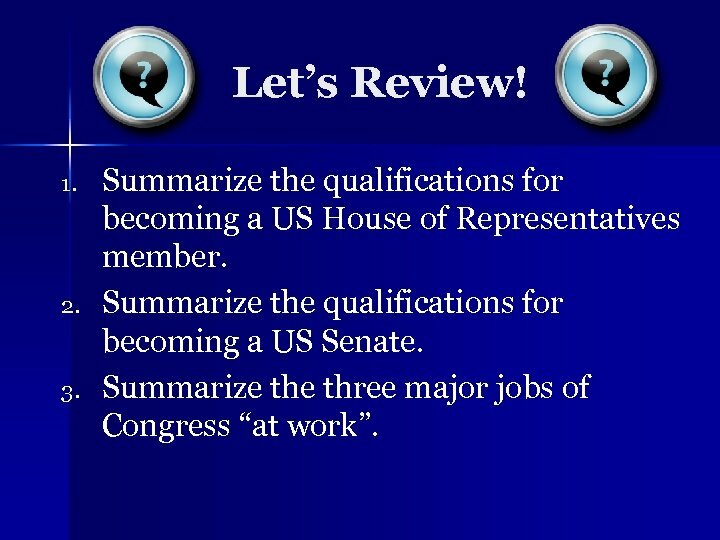 Summarize the qualifications for becoming a US House of Representatives member. Summarize the qualifications for becoming a US Senate. Summarize three major jobs of Congress “at work”. 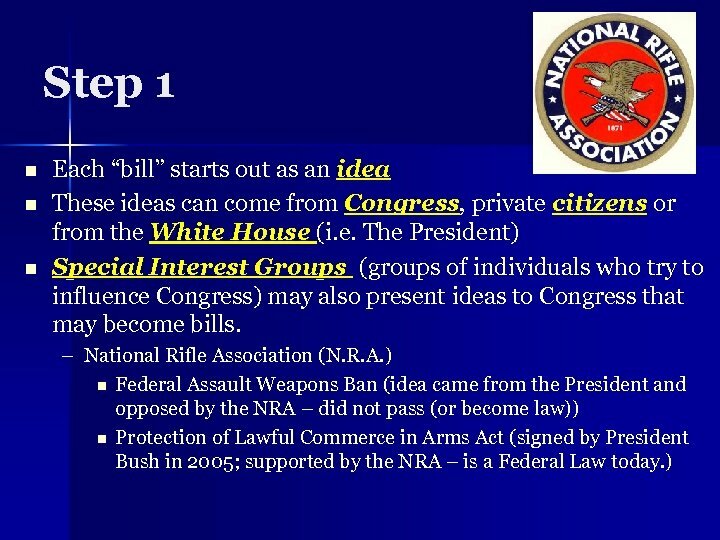 Step 3 n After it is introduced, each “bill” is then sent to the committee that seems most qualified to handle it. 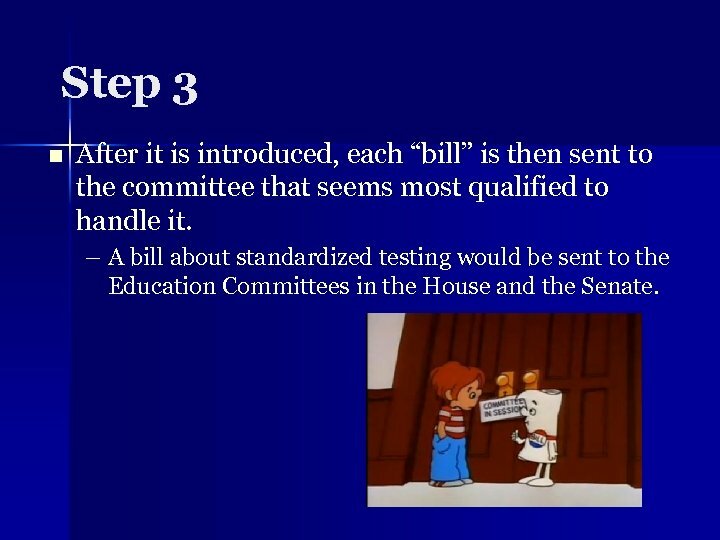 – A bill about standardized testing would be sent to the Education Committees in the House and the Senate. 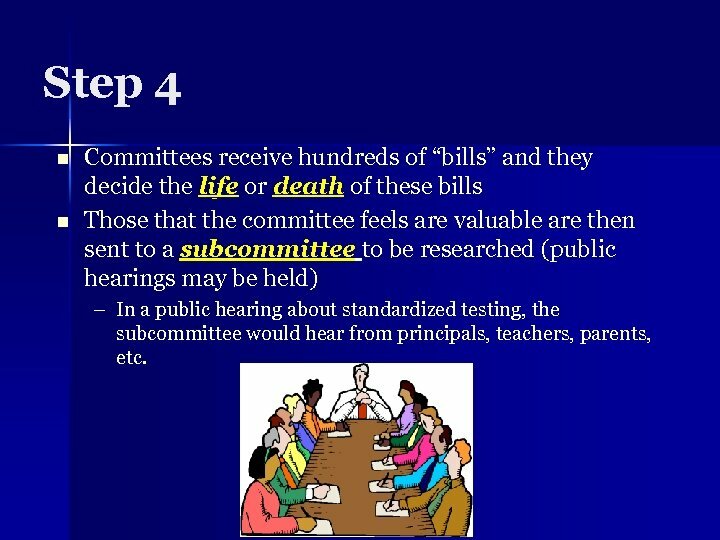 Step 4 n n Committees receive hundreds of “bills” and they decide the life or death of these bills Those that the committee feels are valuable are then sent to a subcommittee to be researched (public hearings may be held) – In a public hearing about standardized testing, the subcommittee would hear from principals, teachers, parents, etc. 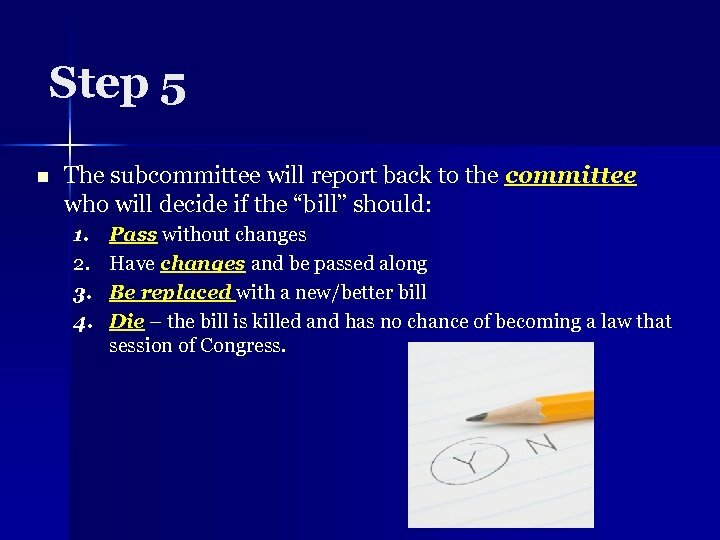 Step 5 n The subcommittee will report back to the committee who will decide if the “bill” should: 1. 2. 3. 4. 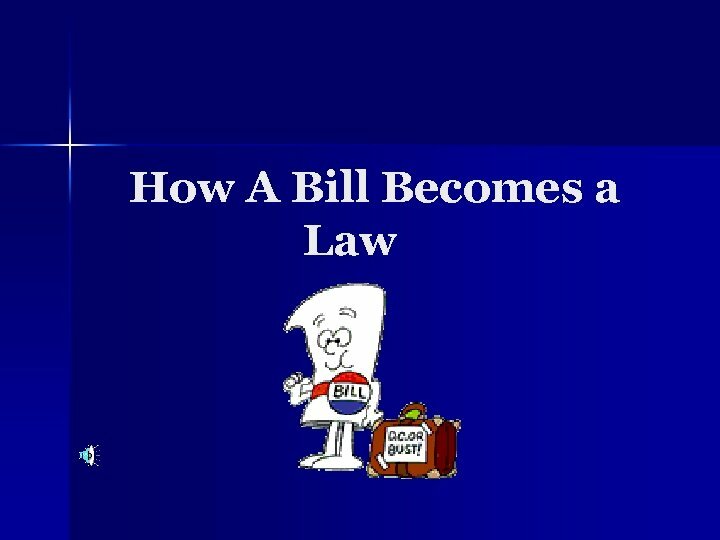 Pass without changes Have changes and be passed along Be replaced with a new/better bill Die – the bill is killed and has no chance of becoming a law that session of Congress. 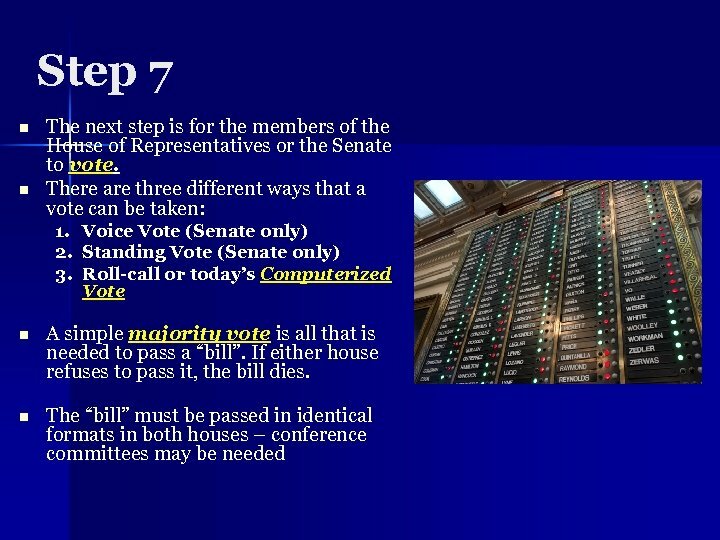 Step 6 n n If a “bill” is approved by the committee, then it is ready to be heard and voted on by the full House of Representatives or the full Senate. 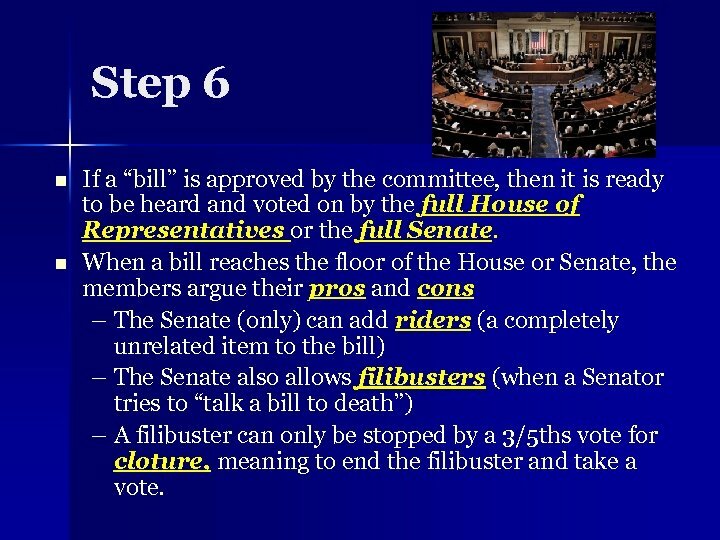 When a bill reaches the floor of the House or Senate, the members argue their pros and cons – The Senate (only) can add riders (a completely unrelated item to the bill) – The Senate also allows filibusters (when a Senator tries to “talk a bill to death”) – A filibuster can only be stopped by a 3/5 ths vote for cloture, meaning to end the filibuster and take a vote. 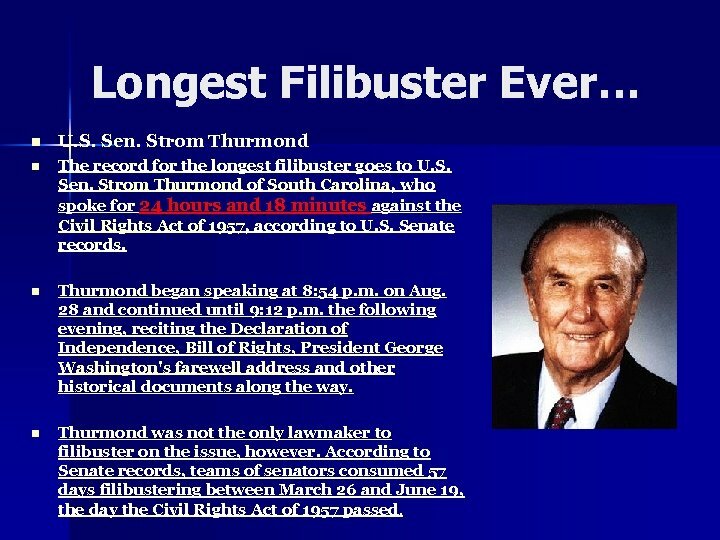 Longest Filibuster Ever… n U. S. Sen. Strom Thurmond n The record for the longest filibuster goes to U. S. Sen. Strom Thurmond of South Carolina, who spoke for 24 hours and 18 minutes against the Civil Rights Act of 1957, according to U. S. Senate records. n Thurmond began speaking at 8: 54 p. m. on Aug. 28 and continued until 9: 12 p. m. the following evening, reciting the Declaration of Independence, Bill of Rights, President George Washington's farewell address and other historical documents along the way. n Thurmond was not the only lawmaker to filibuster on the issue, however. According to Senate records, teams of senators consumed 57 days filibustering between March 26 and June 19, the day the Civil Rights Act of 1957 passed. SVD(P 2) – S stands for Sign It! The President can sign the bill into law! 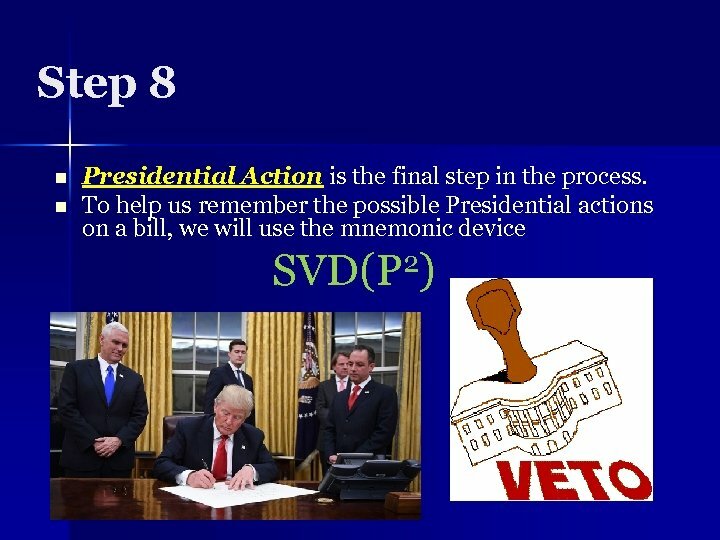 – V stands for Veto – which means to refuse to sign. 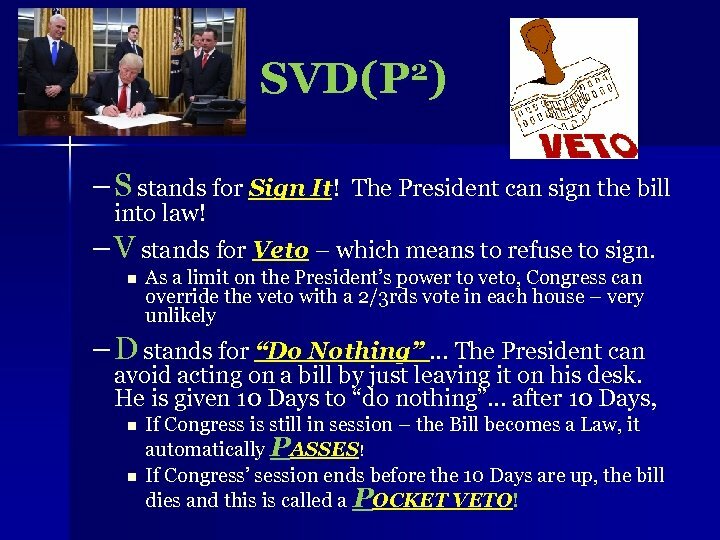 n As a limit on the President’s power to veto, Congress can override the veto with a 2/3 rds vote in each house – very unlikely – D stands for “Do Nothing” … The President can avoid acting on a bill by just leaving it on his desk. He is given 10 Days to “do nothing”… after 10 Days, n n If Congress is still in session – the Bill becomes a Law, it automatically PASSES! If Congress’ session ends before the 10 Days are up, the bill dies and this is called a POCKET VETO! 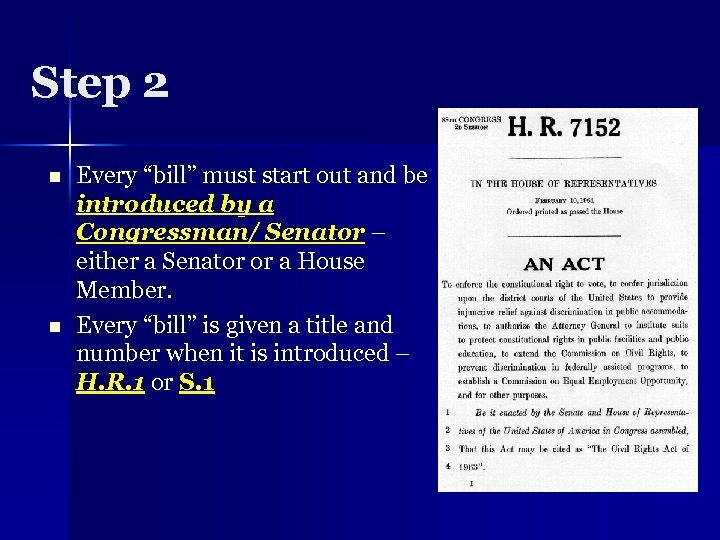 How a Bill Becomes a law 1. 2. 3. 4. 5. 6. 7. 8. 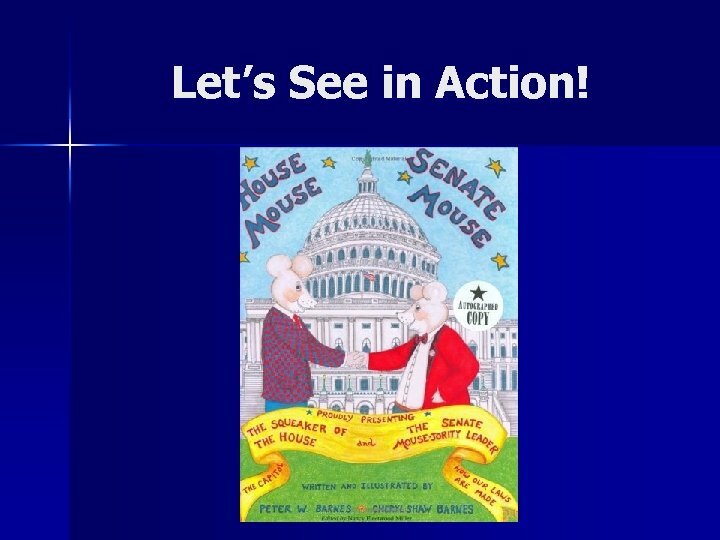 Idea Introduced Committee Subcommittee Committee Full House or Senate Debate Full House or Senate Vote Presidential Action Click here! 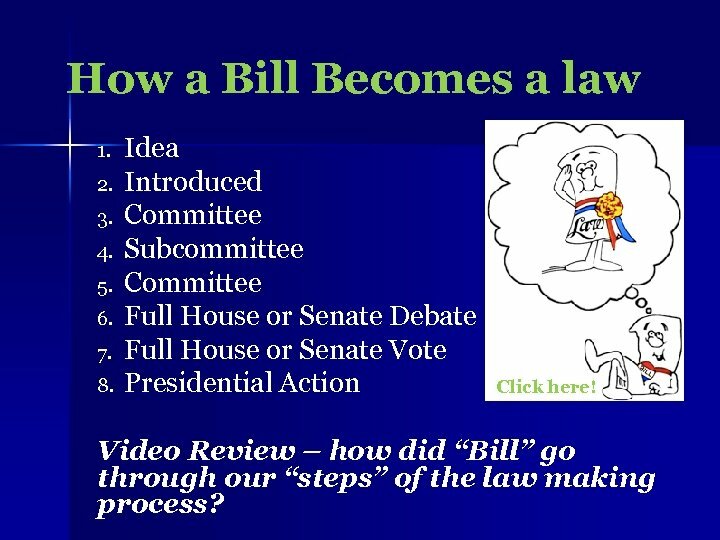 Video Review – how did “Bill” go through our “steps” of the law making process?